Paige and Justin are creating optimal growing conditions for their vegetables as well as lengthening their growing season with the addition of a permanent high tunnel. The unheated greenhouse helps Paige and Justin increase crop quality and uniformity, make better use of space on limited acreage, and offer produce several weeks before and after their typical sales period. 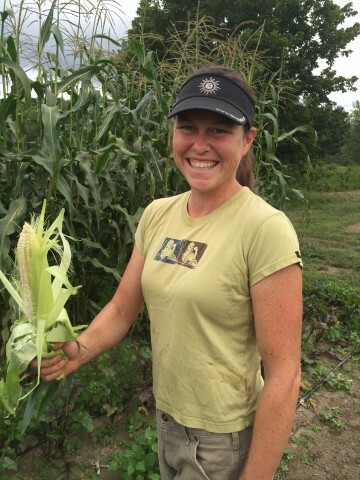 “We can harvest successions of crops and keep our customers and community eating fresh and local produce,” Paige said. 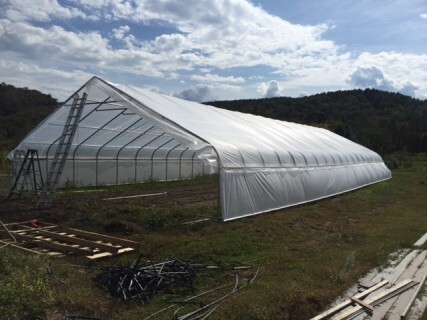 The high tunnel is particularly helpful in Transylvania County, the wettest county in the state. The plastic shields crops from rainwater, alleviating severe disease pressure. Fungal and bacterial diseases thrive on moisture in the soil and on the plants’ leaf surfaces. Paige and Justin have built a 30-foot wide and 72-foot long Gro-Max Gothic structure with roll-up sides. They graded the site, creating drainage and have installed irrigation. With proper drainage, the high tunnel helps conserve soil since well-amended and composted soil under plastic is less likely to runoff in flooding. They are working to increase productive acres to the full six acres at their site in the next two years and have recently applied for organic certification. 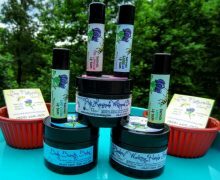 They sell to a 20-member CSA, in which they are increasing membership, at the Transylvania County Farmer’s Market each Saturday, and to restaurants and grocery stores, including Whistlestop Market in Cedar Mountain and Food Matters Market in Brevard. 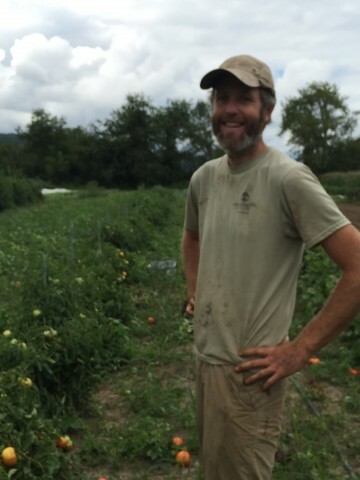 In the spring and summer, at least half of the produce at Food Matters is from Pitch Pine Farm. Paige and Justin have been farming together for 10 years. They are graduates of Clemson University where they were a part of the student organic farm. They then worked on Sisters Hill Farm in New York before taking over management of Serenbe Farms in Georgia. The 8-acre farm southwest of Atlanta is supported by the Serenbe village, a community of EarthCraft and LEED-certified homes, restaurants, shops and galleries. Paige and Justin left Serenbe to start their own farm in 2014 in Transylvania County, where they have always loved to visit to mountain bike. See www.pitchpineorganicfarm.com or look them up on Facebook or Instagram.